Spring is in the air and we are celebrating with the infamous #NoNakedChicken party!!! 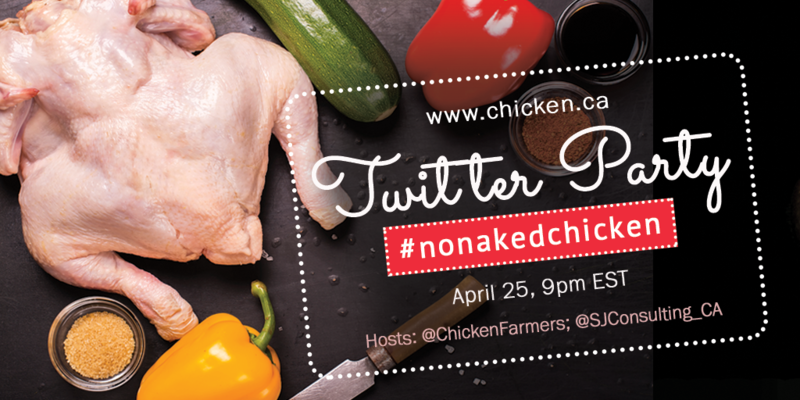 Join us at the#NoNakedChicken Twitter Party on Wednesday April 25, 9pm EST!! We are chatting about chicken rubs and sauces for spring chicken! We’ll spend a fun-filled hour sharing yummy BBQ recipes along with tips and tricks for better grilling from our friends at Chicken Farmers of Canada. $1000 in prizing! Prizes include: a BBQ, a double hammock, and a Outdoor Fire Pit Table.